When the wind blows out of the NE in November in Ft. Lauderdale fishing for Sailfish becomes a good option for a successful charter for anglers hoping for a big fish. And we have had nothing but wind for over a week now and the rough sea conditions have caused us to stay ashore a couple of days we were o-so-ready. With a slight lessening of the wind we slipped offshore to see what all the wind and the high seas had done for the fishing. As we have said more than a couple of times fishing can be tough offshore this time of year and there are days we will struggle, but there are some good catches as well. We had Bob and his wife Terry aboard the Marlin My Darlin as we headed through the jetties in seas that were still running 3 to 5 feet. Paltry compared to what it had been. I had braced them for 4 to 6, they said let?s do it, and if you can be pleased with 3 to 5 we all certainly were. They have been several times with us in the past and they were ready to roll. Crystal clear water today in 120 feet just off the edge of the outside reef. North current at about a knot and lots of baitfish immediately visible in the area. We set up the kites and the live baits right in front of the inlet. There seemed to be no reason to look for better conditions as it seemed fine right there. 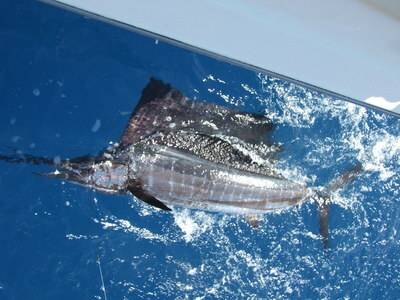 Two Sailfish out of three bites with one for Bob and one for Terry. The fish were tailing out at the surface and making their way south at a good rate of speed. Quick no nonsense bites today. Some reel nice gaffer sized Mahi-Mahi as well and a lone Blackfin Tuna rounded out their trip. One of those good days we spoke of. Hopefully this action holds.